Notes: Based on the manga of the same name by Fujisawa Tohru, originally serialized in the WEEKLY SHONEN MAGAZINE published by Kodansha Ltd, and currently available from TokyoPop. This manga has also been adapted into an immensely popular live-action series. Meet Onizuka Eikichi, a 22-year-old virgin ex-biker-gang leader and college Karate champ. He's crude, foul-mouthed, and has a hair-trigger temper. His goal: to be the Greatest High-School Teacher in the World! Finishing this series was the most bittersweet moment in my anime-viewing history, bar none. Pure and simple, I love this series, and from what I hear on boards and anime sites, I am not alone. Now why, you may ask? Well, let me tell you why: sheer character depth and development. Other series may have a few main and supporting characters develop, making that particular series a "good" series (such as Vandread). In no other anime, though, have I ever seen an entire ensemble cast of supporting characters (I think I counted at least ten) go through so much development in a single series, like Murai, attitude extraordinaire, the psychotic Kanzaki, and the uber-wimp Yoshikawa (just to name a few). So many characters to choose from, and with all of them individually focused on and developing right before our eyes, everyone's favorite gets their fair share of the limelight. Plotwise, this anime is fairly straightforward: Become the Greatest Teacher Ever! (Oh yeah, and don't get fired.) A simple enough track that actually keeps going incredibly well thoughout the whole series. Simply put: this is the longest series that I have ever seen with almost no filler whatsoever. 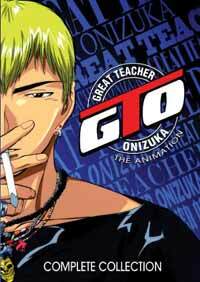 It's only noticeable through part is the first volume (four episodes) where the only character you're introduced to is Onizuka (read: 22-year-old virgin, rebel, LETCH). Even then though, he is a fairly likable character, he just really does not come into his prime until the rest of his supporting cast is introduced. As for the artwork? Well ... My resounding recommendation is especially puzzling (for me) because this anime's artwork, while being high in quality, does have a unique style all its own. Needing to be seen to be truly experienced, all I can really say is that it only feels ugly in certain instances, and that those instances actually are part of the comedy. They just take some getting used to. Seeing as how music is usually a non-factor for me in how I like the title, this title again presented a unique situation: actually inspiring me to go out and buy the CD of the soundtrack. Unfortunately though, I will still have to search for another soundtrack with the opening and ending themes, four songs that I have absolutely grown to love in the last couple of years. A point for the English dub too, I like it much better than the sub (cue fanboy horror). No really though, David Lucas (Onizuka, also Spike in Cowboy Bebop, and Kusanagi Shizuma in Real Bout High School) does a beautiful job with his role. The voice director really knew what he was doing as well, keeping the dub precise and clean (with funny outtake extras to boot). In conclusion, this anime is a completely unique and amazing anime "experience" all its own. Recommended Audience: Contains language, violence (usually slapstick), and intense situations, but my 15 year-old brother ate it up, so I'd say for teens and older.